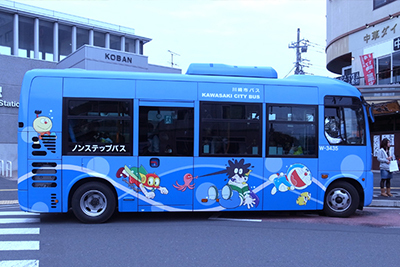 Join Kanda-kun and Machi-chan on their trip to the Fujiko F. Fujio Museum, located in the suburbs of Kawasaki city! Kanda-kun: Today, let's visit a museum dedicated to the works of one unforgettable mangaka. Machi-chan: There are countless mangaka in existence, but Fujiko F. Fujio is one of few to find a place in the hearts of so many people, young and old. 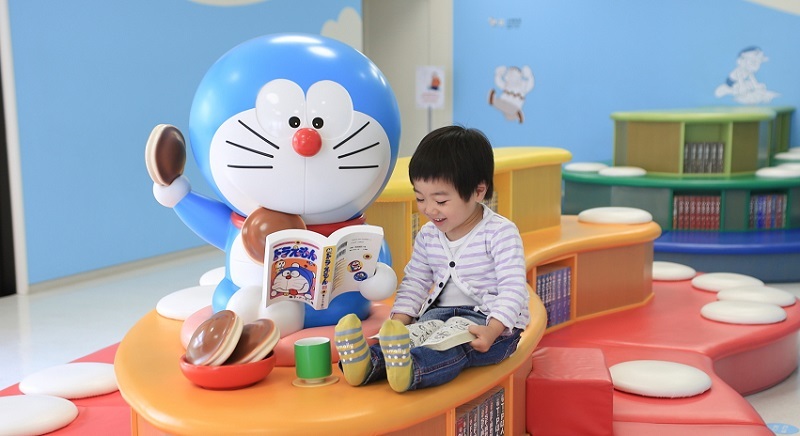 Fujio's most famous creation, Doraemon, releases at least one new movie special every year. 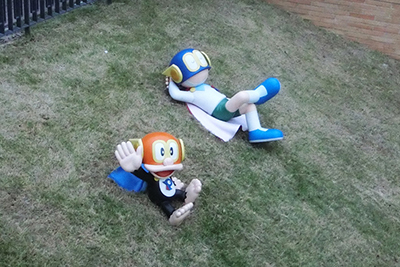 And although Fujiko F. Fujio is no longer with us, his legacy lives on in all the people he has touched. Kanda-kun: The museum is located in Kawasaki city of the Kanagawa prefecture. This is Fujiko F. Fujio's hometown! 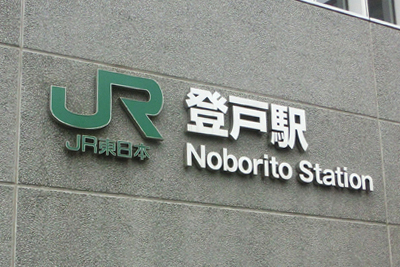 The closest station is Noborito Station, around 30 minutes from Shinjuku Station by train. From there, you can board the special shuttle bus to get to the museum. 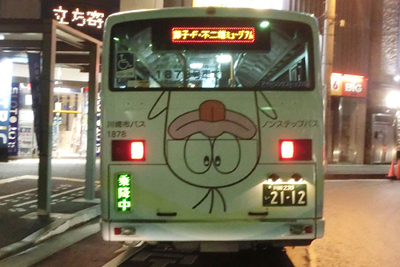 Machi-chan:Finally, it looks like the bus has arrived. How adorable! 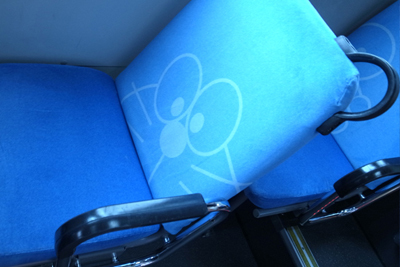 Kanda-kun: Not only are decorations for the outside of the bus fantastic, the inside decorations (even the floor sheets) are all covered in cute Fujiko F. Fujio characters as well. There are four different designs to choose from! Machi-chan: Where can we get tickets to enter the museum? 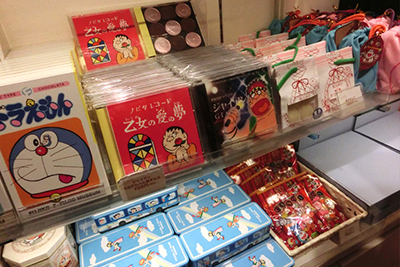 Kanda-kun: You can buy them at any Lawson convenience store by using a ticket vending machine called “Loppi”. Just insert the date and time (10:00, 12:00, 14:00 or 16:00) you would like to enter the museum and the number of people attending, and the machine will print out a special barcode. Hand this barcode to the cashier, pay, and you will get the ticket instantly. Be careful about being on time because if you arrive at the museum over thirty minutes past the entrance time you decided on, you will not be able to get in. Machi-chan: Oh, okay! So what about our tickets? Kanda-kun: I already bought them, of course! This museum is extremely popular, so there's a pretty good chance that on weekends and public holidays, tickets may be sold out for that day. 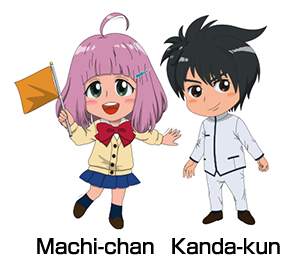 Machi-chan: Thanks for being so prepared! Travelers interested should definitely reserve their tickets as soon as they can then. Kanda-kun: Sorry for the wait Machi-chan! Let's go! Machi-chan: Oh goody! 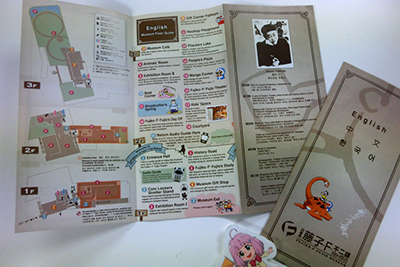 They gave us a museum map pamphlet. Kanda-kun: It looks like it is also available in English, Chinese, and Korean. Machi-chan: Ah! There is also a free rental audio guide. Kanda-kun: Inside the building, you can enjoy the Fujiko. F. Fujio biography, work chronology, exhibition area, manga corner, museum café, a garden full of characters, a testimony video by relatives, and so on. Machi-chan: There are so many things to see... I'm exhausted just thinking about them all! Let's rest a bit at the museum cafe first! 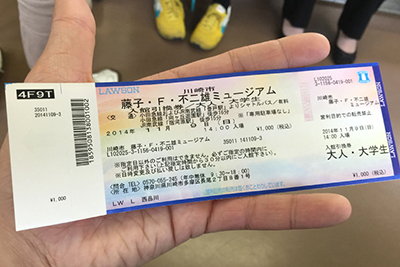 Kanda-kun: The cafe is very popular, so we recommend taking a numbered ticket as soon as you get there. Machi-chan: Wow! 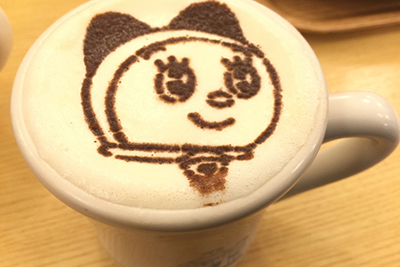 There are drinks (coffee and cocoa) with Fujiko F. Fujio characters drawn on them! How cute! Even the food has character-inspired designs! Everything is so delicious that it's difficult to choose only one! Kanda-kun: When we finish eating, let's go out to the rooftop playground and see what kind of surprises it holds. Machi-chan: That cute green field? Sounds like fun! 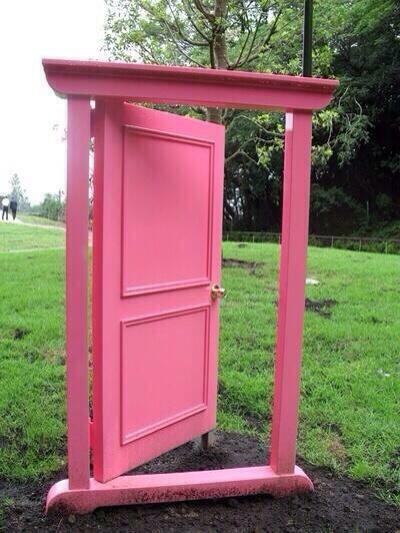 Kanda-kun: There's the infamous “teleportation door”! Let's take a picture together! 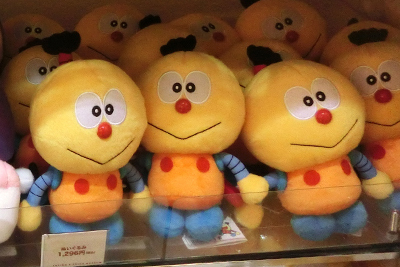 Machi-chan: Wh...what's that underneath Doraemon and Nobita?! 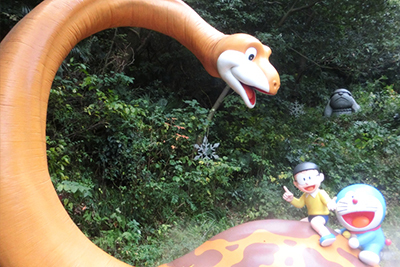 Who knew the Fujiko F. Fujio Museum could bring not only anime characters to life, but also the extinct! Kanda-kun: Look, there's the theater. Let's watch one of the limited edition Fujiko F. Fujio films, only available here! Machi-chan: I'm looking forward to watching it! You know what else I'm looking forward to? SHOPPING! Kanda-kun: There are so many to choose from! Machi-chan: No problem. I already know exactly what I'm getting! Kanda-kun: Machi-chan, hurry up! Here comes the bus! Kanda-kun: So what exactly did you buy at the souvenir shop? Kanda-kun: Machi-chan... 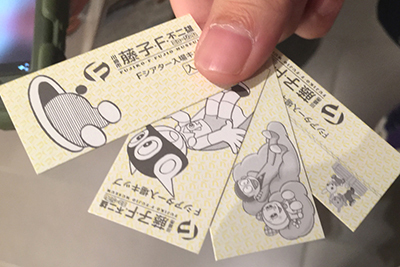 Thanks to all of you for joining us on our tour of the Fujiko F. Fujio museum! We hope to see you again soon! We would love to help foreign tourists in Japan by providing interesting information about Japanese culture (including the otaku subculture, of course) while also saving you money and time! Please check out our site for more information about sightseeing in Japan! Guide of Tokyo Station - Shops, Restaurants and Tons of Anime! With a history of over 100 years, Tokyo Station is not only an important base of transportation for the people in Japan, but also a famous landmark for the most populated city in the country. Get ready to explore one of the world's most renowned train stations. All aboard! 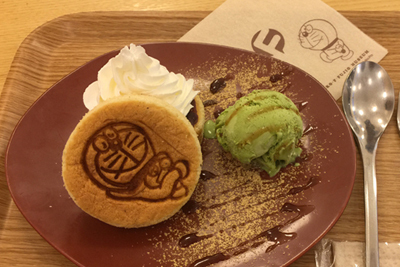 This Cute Cafe in Tokyo Will Make You Feel Like You're In Anime! Cute anime girls are always hanging out at cute cafes! This adorable themed cafe in Shibuya always changes their theme, and have done everything from Pokemon to Sanrio characters! This time, their theme is art by Kanahei, a popular artist in Japan. Come explore yet another Tokyo central area! This week's destination is Ikebukuro, the home city of Durarara!, Otome Road, and much more! Japan is full of different sights and sounds. Many of these areas are used as reference images in your favorite animes! Let's delve into the backgrounds of different shows and explore Japan! Today's article is about the fashion central, Shibuya Station.